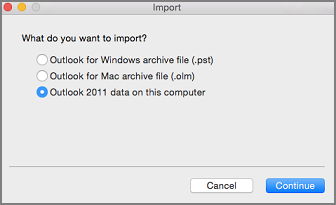 Outlook for Mac 2011 data is one of the options on the Import page. You use this feature when upgrading from one computer to another or when upgrading to Outlook 2016 for Mac. The Outlook data includes a set of email messages, contacts, tasks, calendars, and settings associated with an Outlook 2011 account. The set of Outlook data was called an "identity" in Outlook 2011 but is now known as a profile. If you see the following error when attempting to import Outlook 2011 data, create a new profile (identity) and set it as the default,then attempt the import again. To create a new profile, in Finder, browse to the Application folder. Press CTRL and then click Microsoft Outlook to see the contextual menu, and then click Show Package Contents. In the Contents > SharedSupport folder, double-click Outlook Profile Manager. In the Outlook Profile Manager window, click the Add button and give the profile a name. Next, click the Options button and click Set as Default. 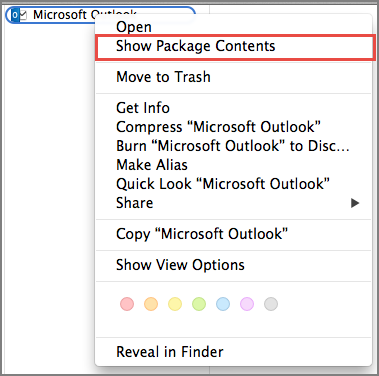 After setting a new default profile, open Outlook for Mac and click File > Import. Select the content you want to import and click Continue. Complete the rest of the steps as instructed on the Import screens.